Bartonella is a genus of bacteria. It is the only one in the family Bartonellaceae. The species can be parasitic and cause diseases in animals and humans. They live mostly in the cells of the host, as intracellular parasites. Bartonella species are pathogens. Bartonella species are transmitted by vectors such as ticks, fleas, sand flies, and mosquitoes. 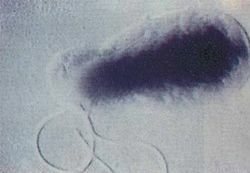 At least eight Bartonella species or subspecies are known to infect humans. Bartonella is named after Alberto Leonardo Barton (1870–1950), a medical microbiologist. Bartonella Facts for Kids. Kiddle Encyclopedia.